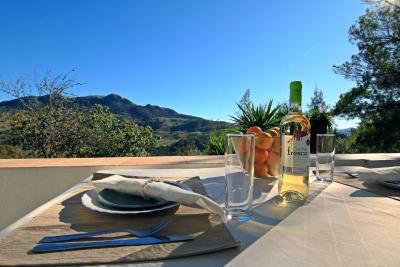 Lock in a great price for Casas Rurales Los Algarrobales – rated 8.9 by recent guests! The peace and quiet. Also it was very well presented. The setting is really nice on the edge of the natural park. Plenty of walking opportunities. Excellent food in the village. The nature and surroundings is amazing. The view from the swimming pool is fantastic! Lovely quiet location with a great view. Very clean with everything you need. When you asked for help the staff were very happy and quick to help us. 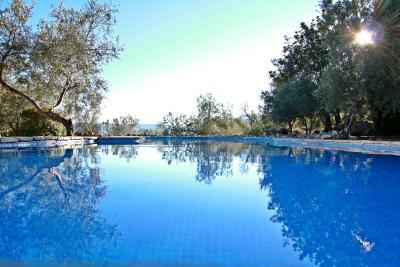 The pool is fabulous - lovely and large with enough beds for everyone. Table on the terrace and inside the house for eating. Even our inside table had great views. The walk to El Gastor is pretty, although a little hilly. Would not recommend on a really hot day, but if you have a cool day it is worth the effort. Amazing mountain views.Peaceful, Rural location. Great for walking. Located on a hill with beautifull outlook. Nicely decorated and extremely clean. Very quiet place. The houses are reached by a dirt road, but it is well maintained. Use Google Maps to find it, as your standard navigation system wouldn't know where to go. On the morning of our departure the swimming pool was visited by 5 goats (?) to have a drink. I guess we were not the only ones who thought it was clean! Very rural,3 km dirt track road to property. Good basic facilities. 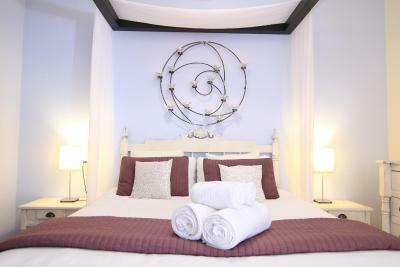 comfy bed, sofa and kitchette all in one spacious room plus separate bathroom. Super swimming pool. Segunda vez que nos alojamos aquí, esta vez en Paraísos Escondidos, con unas vistas fantásticas y sin ruidos. No nos hozo falta usar la chimenea (la de estas casas es abierta) porque tienen muy buena climatización con radiadores. La cocina equipada con todo lo necesario. Buena cama y excelente limpieza. El trato del personal inmejorable, pendientes de cualquier cosa que necesites. La sensación de aislamiento del mundo. Todo muy limpio. Casas Rurales Los Algarrobales This rating is a reflection of how the property compares to the industry standard when it comes to price, facilities and services available. It's based on a self-evaluation by the property. Use this rating to help choose your stay! 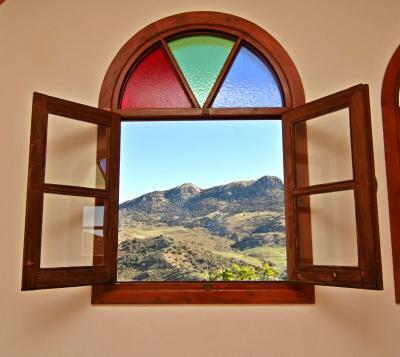 One of our top picks in El Gastor.Casas Rurales Los Algarrobales have a peaceful setting in the Sierra de Cadiz mountains, 30 minutes’ drive from Ronda. 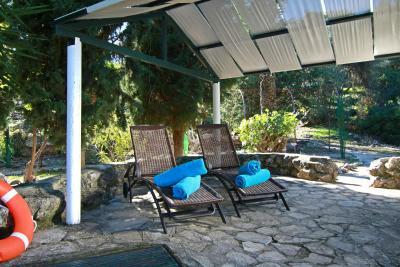 It offers accommodations with air conditioning and free WiFi. 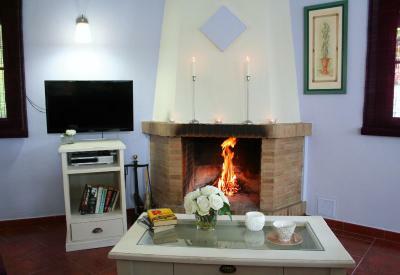 Each country house has a spacious living area with an open fire and TV. There is also a full kitchen with a washing machine. All have access to a tennis court located in the complex, and rackets and balls can be requested at check-in. 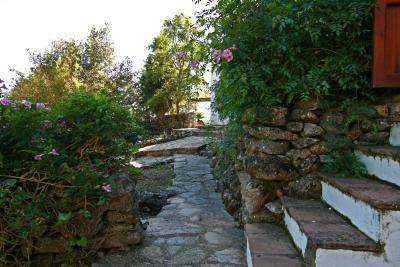 The Los Algarrobales Country Houses are located near the village of Gastor. Access to the houses is via a 1.2 mi track which leads from Gastor. 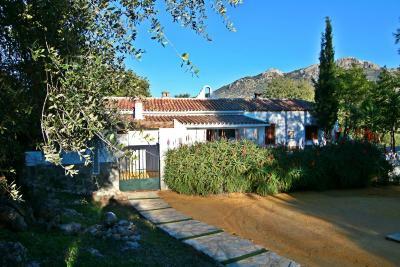 The houses offer wonderful views of the Sierra de Grazalema Nature Reserve. 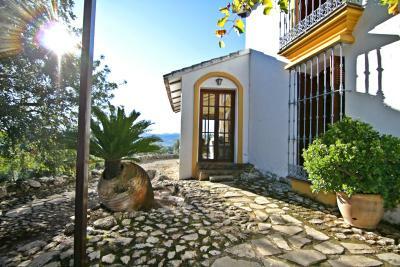 They are on the famous White Villages Route of Andalucia, with good road access to Ronda and Jerez. 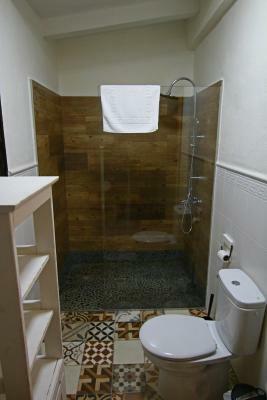 When would you like to stay at Casas Rurales Los Algarrobales? This air-conditioned house features a private swimming pool and a balcony with views of the mountains. It has 1 double bedroom and 1 bathroom with a bath and hairdryer. There is a spacious living area with a fireplace, and a TV a USB port. There is also a full kitchen with a washing machine. Heating and free WiFi are also available. 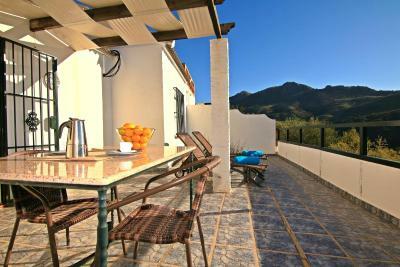 This air-conditioned cottage features a terrace with views of the mountains and a private swimming pool. It has 1 double bedroom and 1 twin bedroom, as well as 1 bathroom with a bath and a hairdryer. The kitchen is equipped with an oven, microwave, and kitchenware, and the living area includes a fireplace, large sofa, and a flat-screen TV. Free WiFi is available. 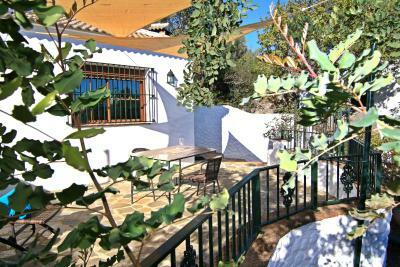 Offering a private terrace and impressive views of the Zahara-El Gastor Reservoir and Sierra de Grazelema, this holiday home has a spacious living room with a fireplace, TV and a sofa, which opens into 2 single beds. 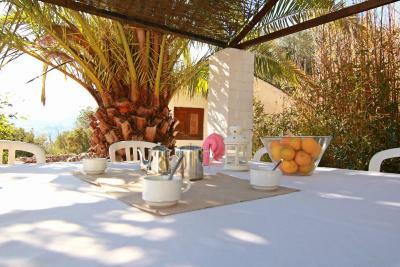 There is a double bedroom, a bathroom and a kitchen with an oven, hob, microwave and kitchenware. Free WiFi via USB is available throughout, and heating and air conditioning are included. 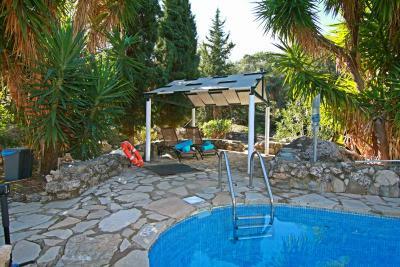 They have access to a shared swimming pool and terrace area. Offering a private terrace and impressive views, this holiday home has a spacious living room with a fireplace, TV and a sofa, which opens into 2 single beds. 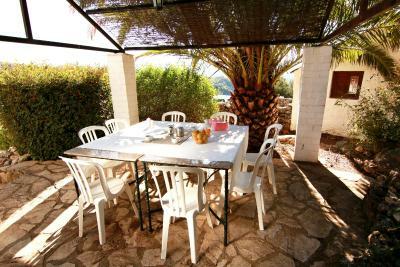 There is a double bedroom, a bathroom and a kitchen with an oven, hob, microwave and kitchenware. Free WiFi via USB is available throughout, and heating and air conditioning are included. This 5-bedroom villa features a private swimming pool and garden area. Free WiFi is available. 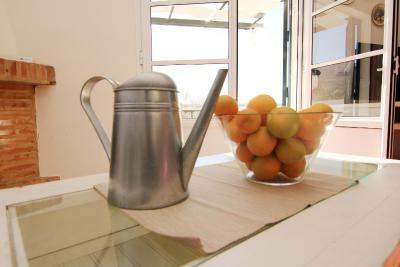 The well-equipped kitchen includes an oven, dishwasher, microwave, washing machine, and kitchenware. There are 2 living room areas, one including views of the Grazalema Hill. A flat-screen TV is also available. House Rules Casas Rurales Los Algarrobales takes special requests – add in the next step! Casas Rurales Los Algarrobales accepts these cards and reserves the right to temporarily hold an amount prior to arrival. For driving directions, guests can contact the property directly using the contact details on the Booking Confirmation. Please inform Casas Rurales Los Algarrobales of your expected arrival time in advance. You can use the Special Requests box when booking, or contact the property directly using the contact details in your confirmation. The Casas are off the beaten track and are, despite good indications, not so easy to find. 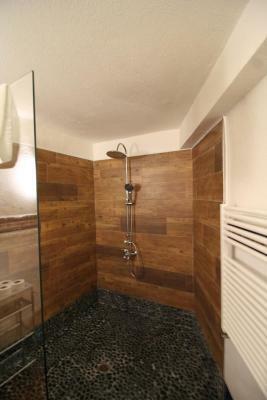 The walk-in shower looked like a recipe for a minor flooding and, despite taking some precautionary steps, water could be found well into the bedroom. The stove is very slow to heat up and thereby made cooking (if indoor cooking was needed) very difficult. The kitchen is adequate, but the hob is a little weak and you need to be very patient even when waiting for water to boil - you’re on holiday, so you have time. But in the morning you have to be patient for your first drink :-). No information in the house to explain the layout of the site and where things are like the washing machine or tennis courts. Some things look great, but in reality they are not practical all the time - for example the chairs in the terrace are too short to make eating at the table easy since you are so low down. Better chairs would have made the stay more comfortable. The track to the accommodation is very rough and rutted.